Five people will go forward to Saturday’s selection meeting to decide the Labour candidate for the upcoming Tooting by-election. The by-election has been triggered by the resignation of Sadiq Khan, who is standing down after 11 years following his landslide victory in the Mayor of London race last week. The by-election is expected to take place on Thursday, June 16. Hopeful candidates were required to submit their applications by Tuesday morning, and a longlist was drawn up that evening. They were then interviewed yesterday by a three-person selection panel of the NEC, who whittled it down to a shortlist of five last night. 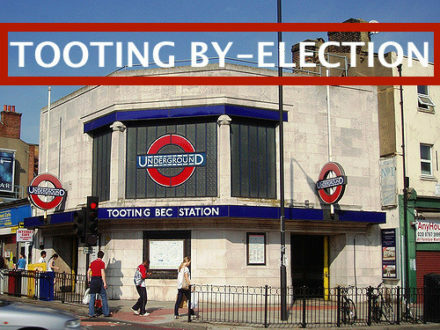 A hustings will take place in Tooting on Saturday morning, with local constituency members voting for their chosen candidate from the field. Naushabah was the Labour’s candidate for Rochester and Strood in both the 2014 by-election and last year’s general, and impressed many with her campaigns in difficult circumstances. The PR consultant is also a councillor in Medway and a keen kickboxer. You can follow her on Twitter here. Mike lives in Tooting, is an A&E consultant in a South London hospital, and has been active over recent months in the junior doctors’ strike. Originally from Northern Ireland, has lived in the seat for five years, where he has also been a ward organiser. You can see his manifesto here. Jasvir has lived in South London for the last 10 years, his place of worship is in Tooting, and he works as a family law barrister. He is also the chair of two London-based charities that work on community cohesion issues. You can see his website here. Rosena was born and raised in Tooting, and continues to live in the area, where she is also a councillor, having served as deputy leader of the Labour group on Wandsworth Council. She works as an A&E specialist doctor in the local St. George’s Hospital. She is thought to be in with a good chance. You can see her website here. Martin lived in the area for 10 years, and his children attended local schools. He works as a national organiser for the GMB, who are supporting his candidacy. He chaired Balham Skills Exchange and remains a director of a local business. Likely to be one of the favourites. You can see his website here.